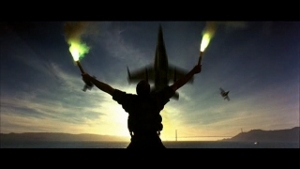 The devout Action Movie worshiper must face west five times a day and sing praises to their god: the McDonnell Douglas F/A-18 Hornet fighter jet. Michael Bay didn’t know it at the time, but he made this movie for my mother. She’s an actor junkie who came of age in a time when movie stars were movie stars and the mainstream culture still surrounded them with auras of “respectability.” As such, she prefers her leading men play flawed-but-noble heroes…though she’s not opposed to the occasional flight of hyper-masculine fantasy (after all, she married my dad). So putting Nicholas Cage and Sean Connery in the same film was like ringing her personal dinner bell. And since I was thirteen at the time, I had no choice but to suffer through this at her side.